Set includes everything you see here! Remote Controlled locomotive with light and sound. Remote allows train to go forward and reverse. 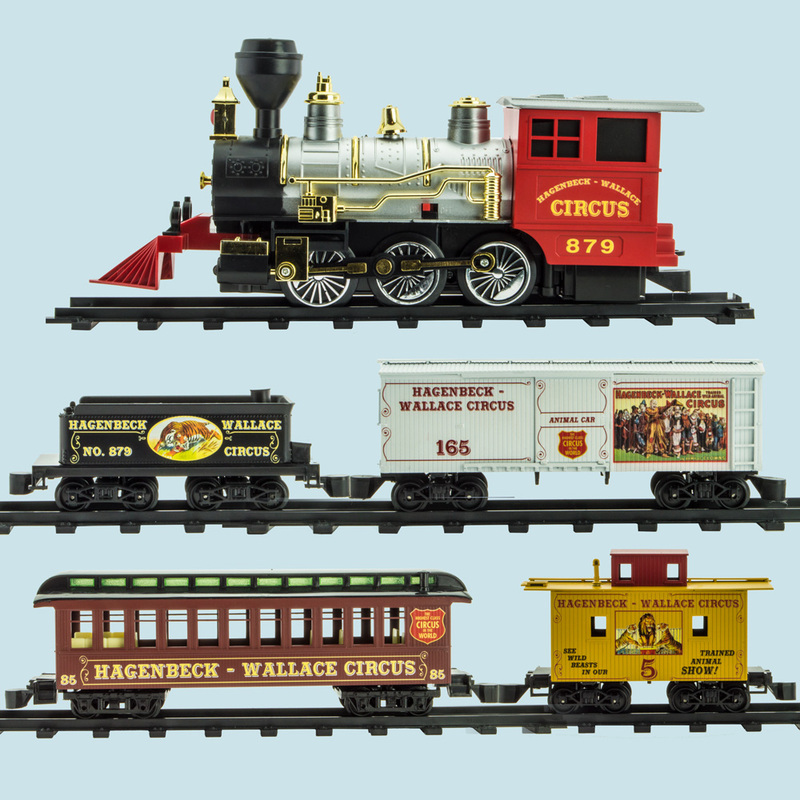 Locomotive pulls a string of four highly detailed railroad cars brightly decorated to advertise the traveling circus. Railroad cars easily connect to each other with a magnetic coupler for simplicity in setting up your train. Easily place your railroad cars on the track with this uniquely designed rerailer that can position the wheels on the track. These rerailers fit into the track system and in the event your train derails, run over the rerailer and you train will right itself on the track. Sample track layout instructions included. Meet Chance Ryder as he time travels back to historical events in early America. In this first book in the series he visits a time when circuses traveled from city to city by train, delighting audiences with magical shows. Learn about the life of a circus roustabout and the events of the worst circus train wreck in American history. First book in a series of historical fiction books. Volume 1 tells the story of the worst circus train wreck in American history. Soft cover. 59 pages, for ages 8-12. Set includes a pewter replica of an actual antique railroad key. Chance discovered the key to his time travel with it. Construct your own circus, including big top tents, animals and characters from the book! Includes 2 circus tents, 4 animals, 4 characters and two circus wagons which makes a fun, colorful and engaging set. In the early hours of June 22, 1918, the Hagenbeck-Wallace circus train was heading from Illinois to perform in Hammond, Indiana. The train had stopped on the tracks. A very tired engineer of a military troop train was driving down the tracks headed straight for the stopped circus train. Mr. Timm, the flagman for the circus, tried to alert the oncoming train engineer by setting flares to warn him of the danger. But the engineer of the empty twenty-one car military troop train had fallen asleep. It plowed into the rear of the stopped Hagenbeck-Wallace circus train at 60 mph. The military train pushed through four cars before it ground to a halt. On that terrible morning, 400 performers and roustabouts were asleep in the circus train. Fire quickly engulfed the circus train. Many of the acrobats, strongmen, trapeze artists, clowns, roustabouts and other performers were injured or killed. Find out if the children of Hammond, Indiana got to see the circus in the full Story behind the Adventure.